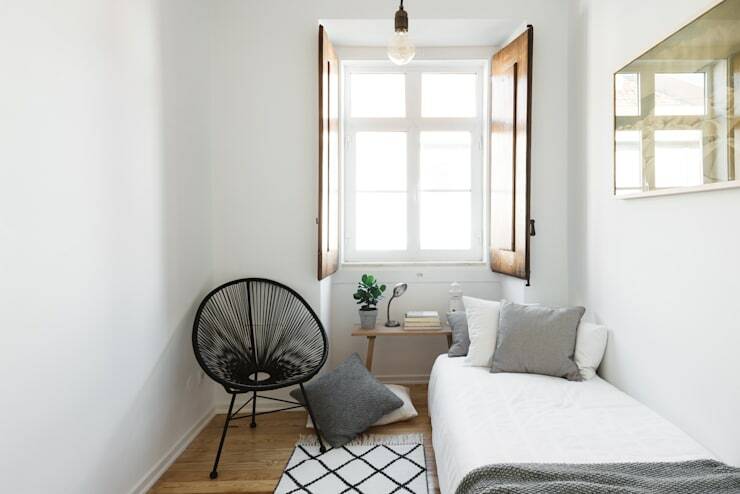 From one sunny country to another, join us today on homify 360° as we jet over to Lisbon, Portugal, a location that is renowned for its beautiful and old-world architecture. But our little trip is not to enjoy the fine weather, excellent cuisine or sightseeing, but rather to gawk at a fantastic apartment that certainly knows how to combine colours and patterns. Yes, this little abode is decked out soothing hues, sleek designs, and cosy textures which makes it all the more inviting. Its use of white and off-white tones ensures a bright and spacious look, so much so that we just have to take note for some fresh inspiration. What’s more, the décor is very straightforward and simple instead of ultra chic, yet it works fantastically in this particular space. 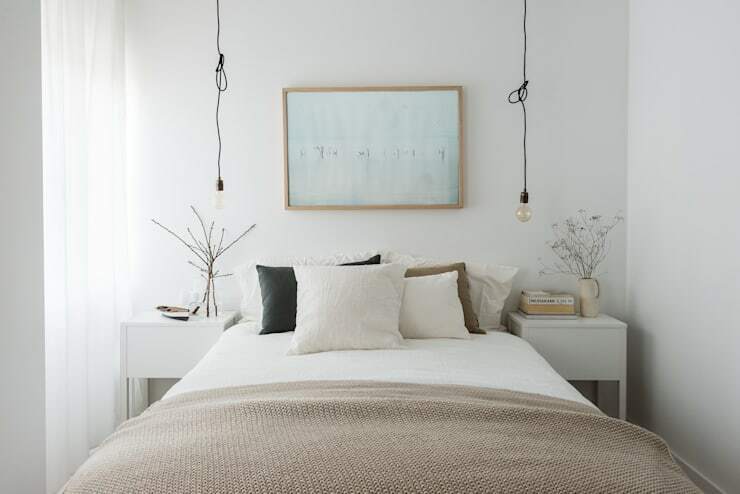 White hues, plush bedding, and an overall soft layout – doesn’t this bedroom look just so peaceful and relaxing? The neat bedside tables add a quirky touch to the master bedroom, while lighting bulbs hanging from wires ensure that bedtime reading won’t be happening in a gloomy space. Just like the bedroom, the living room is decked out in neutrals, albeit in a more earthy palette. But it’s the patterns and motifs used in here that really caught our attention: notice the cushions, rugs, and select décor pieces which all bring about some extra appeal while still keeping the room clean and calm. Need that expert design look? Check out our range of professionals. For a touch of classic taste, a wooden TV console table has been added, with a cane basket on the right ensuring some rustic delight. 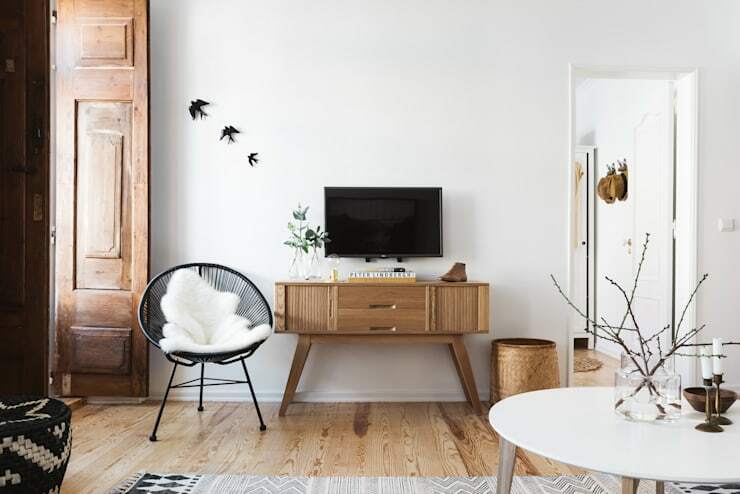 A black metal chair flaunts its ultra modern style superbly without overthrowing the room, instead turning it into a soft eclectic-style area. 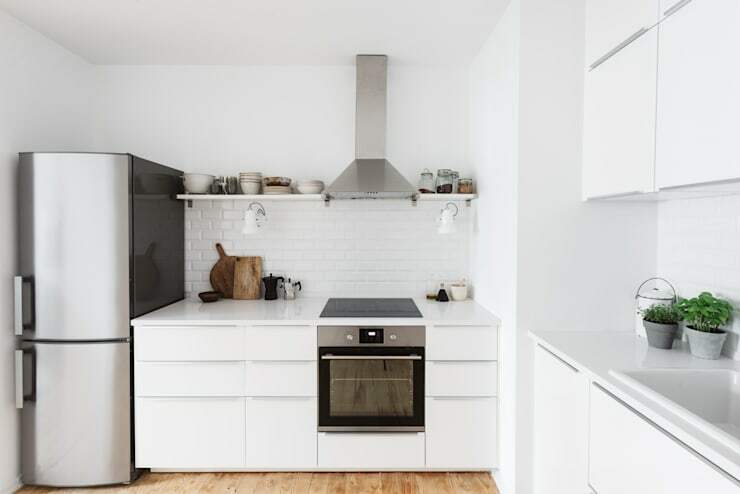 A spotless white colour scheme takes control of the kitchen, letting it flaunt a clean and minimalist-type style. Steel appliances interrupt the white flow ever so slightly while adding a bit of glamour. An abundance of cabinets have been added to offer ample storage space, as well as surfaces for accessories and décor, like the green potted plants. 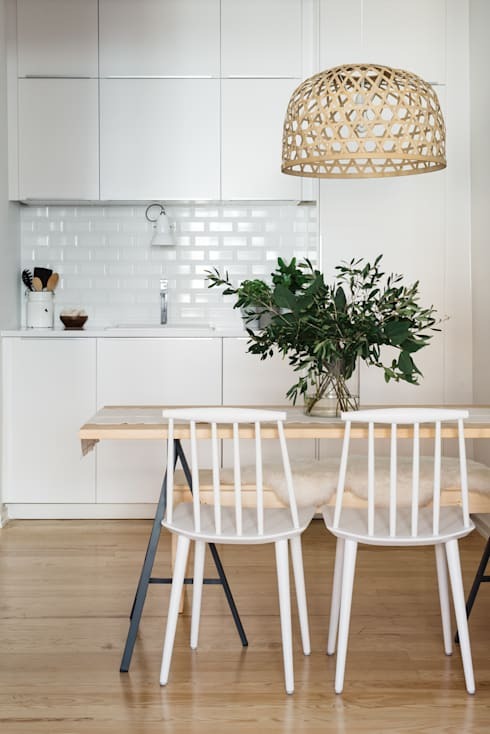 The dining area clearly knows the styling success of wood, as it expertly uses timber to conjure up a charming and homely dining table and matching chairs. Black metal table legs ensure some contrast. Our favourite piece here? It has to be that cane lampshade dangling from the ceiling, which brings about a unique and quaint touch. The guest bedroom makes use of the same light tones as the main suite, ensuring a clean look mixed with elegance and warmth. 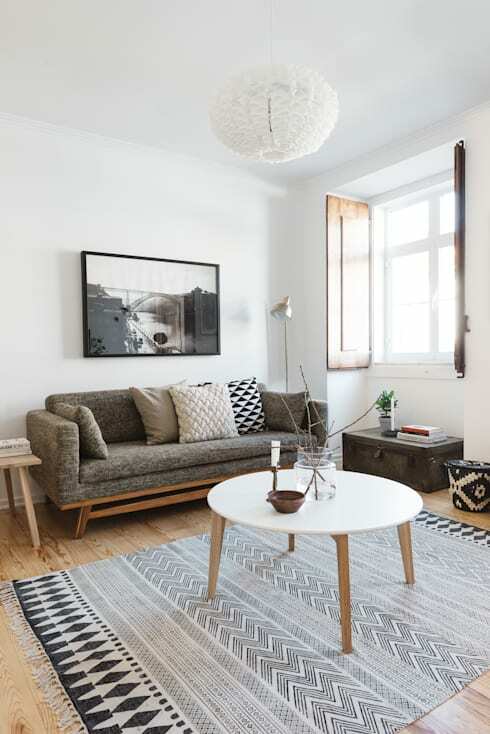 A patterned rug adds visual interest, while a tiny potted plant brings both colour and freshness to the space. Even though the window is quite small, the amount of natural lighting bouncing off those crisp-white surfaces is more than enough to ensure a brightly lit room during the day. When making use of clean spaces and minimalist-style designs, it can be quite easy to resort to a dull and bland-looking space. 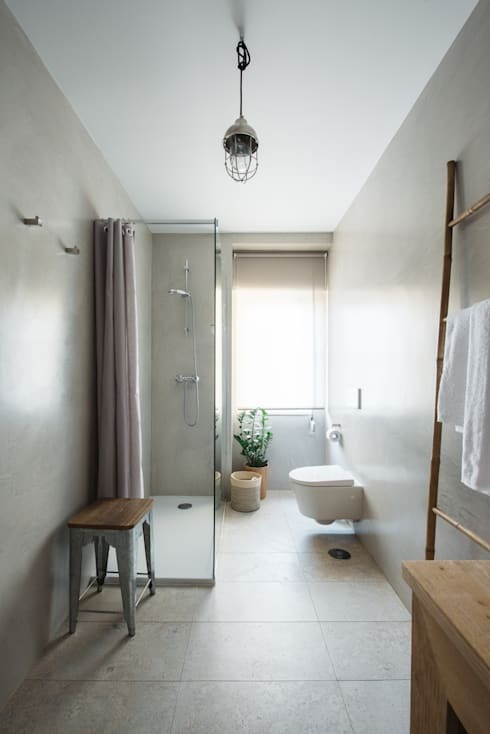 Thankfully, this bathroom manages to avoid that trap effectively, as it uses smooth and shiny surfaces, a hint of stone grey, and the right amount of texture and pattern to make up clean yet stylish space. Of course a bathroom can’t be just about the looks; some functionality is also required. 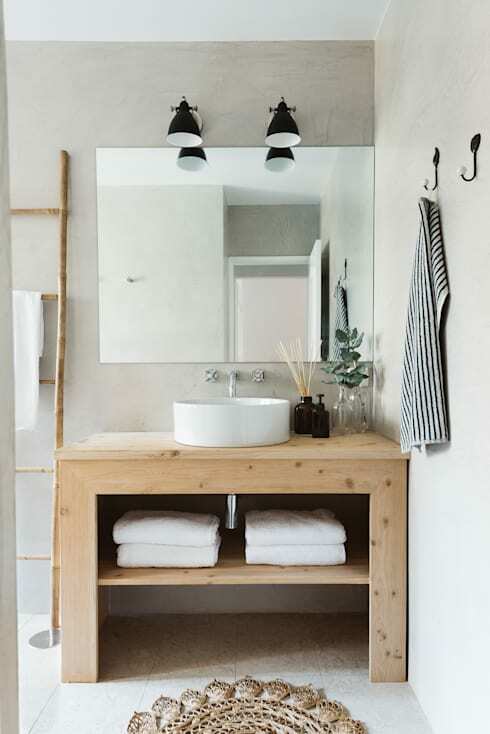 This under-sink wooden shelf is perfect for storing bathroom essentials and towels (even more if you roll them up instead of folding). Along with the bamboo ladder (for hanging textiles), it offers a cosy and warm look. The porcelain sink, black sconces and wall hooks bring about a contemporary style, avoiding a full-on rustic look. However, if you prefer your interior design to be much more rustic, then we suggest you check out: The Home of Rustic Sophistication. What do you think about this interior design style: perfect, or too empty for your tastes?